For nearly fifty years, Woody Carlson has been a grower, manager or production supervisor for some of California’s leading orchid firms. The list includes Shaffers Tropical Gardens, Cobb Orchids, Universal Orchids, West Coast Orchids and the orchid department of the Nurserymen’s Exchange (Half Moon Bay). He has been an AOS Judge and an active hybridizer. The most beautiful flowers in the world belong to the orchid family. One of the most beautiful genus in this family is the Miltoniopsis (mil-toh-nee-Op-siss), popularly called the “Pansy Orchid,” because of the similarity of their appearance to a pansy. They are also referred to as the “Columbian” or “cool-growing” Miltonias. The genus Miltoniopsis, a member of the subtribe Oncidiinae of the orchid family, is comprised of six species and their various forms. In 1837 John Lindley, a distinguished English botanist and orchidologist, established the Miltonia genus based on the warm-growing Brazilian species spectabilis (Lindl. ), and dedicated it to the Earl Fitzwilliam, Viscount Milton (1786-1857). In the years that followed many species of different genera, including the species of the genus Miltoniopsis, were lumped into the Miltonia genus. In 1889 Godefroy-Lebeuf recognized that the Columbian-type species was structurally different from the Brazilian-type species and established the genus Miltoniopsis. The suffix –opsis is a Greek derivative implying relationship to Miltonia. However, the acceptance of the generic name Miltoniopsis by orchidologists, orchidists and commercial growers was stubbornly resisted for years. In 1976, Garay and Dunsterville reestablished the genus Miltoniopsis of Godefroy-Lebeuf for all the Columbian-type species of Miltonia. Today the name Miltoniopsis is accepted by just about all orchidologists, orchidists and commercial growers. Though the genus name Miltoniopsis is botanically correct, The Royal Horticultural Society has retained the name Miltonia for registration purposes. The first Miltoniopsis cross made was Miltp. Bleuana, a cross of Miltoniopsis vexillaria X roezlii, named after the French hybridizer Alfred Bleu and registered in 1889. Since then over 2,000 Miltoniopsis hybrids have been registered, but under the genus name Miltonia. Miltoniopsis bismarckii Dodson and Bennett. Origin: Peru; found in the Department of Huanuco in wet tropical forests of the Cordillera Azul at 3,300- to 3,400-foot elevation. Flowers re light pink to rose, 1-1/2 inches in diameter. Miltoniopsis phalaenopsis (Linden and Rchb.F.) Garay and Dunstrville. Origin: Columbia; found in humid forests on the western slopes of Cordera Oriental near Velez and Ocaña at 3,800- to 4,900 foot elevation. Flowers are white; lip is marked by purple to red streaks and blotches; the diameter of the flowers is 2 to 2-1/2 inches. Miltoniopsis roezlii (Rchb.F.) Godefroy-Lebeuf. Origin: Panama and Columbia. In Panama near El Valle de Anton and near Santa Fe de Veraguas at 1,000- to 3,300-foot elevation in moist forests. In the Choco region of Columbia, Miltp. Roezlii occurs near sea level in very wet forests. 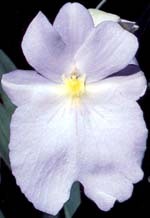 The flowers are white with a purple blotch at the base of each petal. The diameter of the flowers is 3 to 4 inches. Miltoniopsis santanaei Garay and Dunsterville. Origin: Venezuela, Columbia and Ecuador. Plants in Venezuela grow in the northeastern part of the country in damp forests at 1,950-foot elevation. Plants in Ecuador grow in the Andes cloud forests at 1,150 to 3,300 feet. The 2- to 2-1/2-inch flowers are white with a tinge of yellow or green at the base of the tepals. Lip has a patch of yellow near base with fine purple lines. Miltoniopsis vexillaria (Rchb.F.) Godefroy-Lebeuf. Origin: Colombia and Ecuador ar elevations of 4,250 to 7,050 feet. Usually found growing on the western slopes of the Cordillera Occidental on edges of wet mountain forests. The flowers vary from blush pink to rose and some can be white. Diameter of flowers range from 2 to 4 inches. Miltoniopsis warscewiczii (Rchb.F.) Garay and Dunsterville. (Miltoniopsis warscewiczii was formerly known as Miltonia endresii (Nicholson)). Origin: Costa Rica and Panama, at elevations of 4,600 to 6,500 feet. The fiddle-shaped flowers are white with faint reddish purple area near the base of the segments. The lip has a hairy yellow callus with three short ridges in front surrounded by a dull reddish purple area. Diameter of flowers is 2 to 2-1/2 inches. These cool- to intermediate-growing Miltoniopsis species are epiphytic. They are found growing in the tops of trees that border the dense mountain forests at the 700- to 7,000-foot elevations. Miltoniopsis have sympodial growth. The pseudobulbs are oval to oblong and smooth with a single leaf growing from the top. Growing from the apex of the pseudobulb are three to five, tall thin leaves which are sheathed on the lower half with smaller leaves. The peak flowering season is early April to July; however, some clones may flower in the fall or at various times of the year as new growth matures. The slender inflorescence emerges from the leaf axils at the base of the large leaves. It is not uncommon to have an inflorescence emerge from each side of the pseudobulb, and on some plants with a strong bulb a third inflorescence can emerge from the top of the bulb. The slender inflorescences grow and develop into beautiful arching sprays that vary in length from eight to over twenty inches long. Each inflorescence will carry anywhere from three to ten or more large, flat flowers that are often fragrant. These flowers can last on the plant for a period of six to eight weeks. The magnificent array of bright colors and patterns these flowers come in is absolutely stunning: reds, pinks, deep purples, yellows, whites and combinations of these colors. Their prominent lips are broad and rounded with masks of contrasting color. Some have waterfall patterns and/or spotting on their large, attractive lips. It is unfortunate, however, that the Miltoniopsis flowers are short-lived when cut. From the tmie a flower is cut until it collapses can be anywhere from a few hours to two to three days at most. The best flowers for size and keeping qualities are those that are produced in the crisp, early spring months. Flowers produced later in June or July usually do not last as long due to the warmer weather. As soon as the Miltoniopsis plant has finished flowering, one or two new growths will start to develop from the base of the pseudobulb that has just finished flowering. When these growths have matured the following spring, the plant will send up new inflorescences and flower again. With good culture and tender loving care your Miltoniopsis will continue to reward you with magnificient sprays of flowers year after year. The following parts of this article will delve into the culture of these wonderful plants. Miltoniopsis do best with a light level between 1,000 and 1,500 foot candles. During periods of active vegetative growth in early spring and in the late fall and dull overcast winter months, the light intensity may be increased to 1,800 footcandles. Light can be measured by using certain photographic light meters or by meters specifically designed to read the light in footcandles. The General Electric type 214 or 217 light meter and Environmental Concepts Limhid light intensity meter are ideal meters that are specifically made to measure light in footcandles indoors and outdoors. Ortho Books has published “All About Growing Orchids”, which has an excellent article on page 14 regarding the use of any camera that has a built-in light meter to measure light. Miltoniopsis plants grown in the home require light conditions that are basically the same as for African Violets, which is semi-shaded, filtered sunlight, never direct sunlight. An east or west window is preferable to a south window. The desired color of Miltoniopsis foliage should be light green and the leaves should be stiff and upright. Some clones will show a pink tinge on the foliage if given too much light; dark green leaves indicate too little light. If the light readings get down into the 400 to 500 footcandle range, leaves become dark green and lush. Some leaves will flop over as they mature. Also, quite often some of the leaf tips can become infected with bacterial diseases. The new spikes may elongate and usually carry only two or three flowers which are reduced in size. Yellowish green leaves can be a result of too much light. Please note that yellow leaves can also be indicative of other problems which are discussed later under “Watering and Feeding”, “Potting and Potting Medium” and “Pests”. Greenhouses can be shaded by using commercially prepared mixes, shade cloth, bamboo blinds or by mixing latex paint and water to a consistency similar to evaporated milk. An example is one part latex paint to four parts water. On greenhouses the shading can be lightened for the winter months by a strong hosing and scrubbing, or let Mother Nature take care of it with her rain and hail. About the time of the vernal equinox in March, light intensity again starts to increase. At this time start lightly shading until the desired optimum light reading is reached. Miltoniopsis grown in the house basically enjoy the same temperatures that we do. Though they would prefer cooler night temperatures, they will nevertheless acclimate nicely. The optimum temperature range for Miltoniopsis is 75º to 80ºF during the day and 60º to 64ºF at night. Though these are the optimum temperatures for best growth, temperatures in the 85º to 90ºF range for short periods during the day on occasion will cause no harm to the plants if adequate shading, humidity and air circulation are provided. If, however, the proper conditions are not maintained and the plants are subject to these high temperatures over a prolonged period of time, they could be a factor in the slow demise of any flowers that are open. Miltoniopsis that are slowly acclimated during the late summer and early fall to lower night temperatures will easily tolerate 55ºF nights. Though I do not recommend the following, I have grown several thousand Miltoniopsis varying in size from 2-inch seedlings to mature plants in an unheated greenhouse during the winter where the temperature averaged 40º to 45ºF at night with no apparent damage to the plants. Critical temperatures such as these require that the plants have been acclimated to cool nights, and that they are kept on the dry side with humidity lower than normal and that excellent air circulation is provided. The bottom line, however, is that it is far more advantageous to maintain optimum temperatures year round in order to achieve maximum growth and flower production. Perhaps the single most important factor in the successful culture of Miltoniopsis is the correct application of water. Miltoniopsis plants like to be evenly moist. If kept too wet, the roots will rot; if kept too dry over a prolonged period, the plants will dehydrate and die. However, Miltoniopsis has a built-in warning system that tells when it is not getting enough water: If it is being under-watered, the leaves on the new growth will become crinkled and take on an accordion pleated effect. Once the leaves of the new growth are crinkled, they will remain that way, but the leaves on the new growth will become smooth providing the plant has since received adequate amounts of water. Normally, Miltoniopsis should be watered every five to six days with a good drenching, which serves the purpose of flushing out harmful salt buildup. Of course, how often to water will depend on the type and size of the pot used, type of medium used, the temperatures and whether it’s sunny or overcast weather. During exceptionally hot weather, the plants may need to be watered as many as two or three times during the week, and at times during damp, cold overcast weather, once every two weeks should be sufficient. Perhaps a good rule of thumb in regards to watering Miltoniopsis would be, if in doubt, water. Water carefully in during cool, overcast days, doing so early in the day so that the plants are dry by nightfall. Water on the leaves and standing in the axils of the leaves at night when temperatures drop can be very inviting for fungal and bacterial diseases to get a start. Miltoniopsis should be fed at least twice a month with a dilute half-strength fertilizer. Fertilizers specifically formulated for orchids are the most desirable for use. Some of the popular fertilizer formulas used by Miltoniopsis growers are 30-10-20, 20-20-20, 15-15-15 and 24-14-14. It is recommended that those who use a high-nitrogen fertilizer should feed a low-nitrogen fertilizer that is high in phosphate every fourth or fifth feeding. This helps to enhance flowering. A few high-phosphate fertilizers formulas are 10-20-10, 10-30-20 and 15-30-15. Regardless of which fertilizer is used, a dilute proportion is strongly recommended. Over-fertilizing can in time cause not only damage to the plants roots from the salt buildup but also burnt leaf tips. If on the label of the fertilizer package the manufacturer recommends one teaspoon of fertilizer per one gallon of water, cut the amount of fertilizer to one-half teaspoon per one gallon of water. Your Miltoniopsis will enjoy this diluted strength of fertilizer much more than full strength and will reward you with a much finer root system. During cool, overcast winter months, a half-strength feeding once a month should be sufficient. Iron chelates, such as Sequestrene 330 FE used at one-quarter the manufacturer’s recommended strength, are beneficial to add to the fertilizer once a month if it does not already contain any iron. The lack of sufficient iron can cause the plant leaves to become yellowish. Iron, necessary for green growth, serves to lower the pH. Miltoniopsis like water that has a pH of 6.5. Epsom Salts (magnesium sulfate) is also a very important element required by all plants. If your manufactured fertilizer does not contain magnesium, add one half-teaspoon to each gallon of fertilizer solution you prepare at least once every two months. The lack of magnesium robs your plants of the ability to produce the proper amount of chlorophyll. This can cause yellowing of the leaves which can be similar in appearance to chlorosis of leaves caused by iron deficiency. Magnesium sulfate also helps your plants be more resistant to cool temperatures and to increase the yield of flowers. Miltoniopsis require good air circulation and a moist environment whether grown in the house or greenhouse. In nature, Miltoniopsis grow in the tops of trees at elevations ranging from seven hundred to seven thousand feet. Here, they are frequently shrouded in clouds full of condensed water vapor until late morning before the clouds are burned off by the sun. Then, quite often in mid-afternoon, the plants are subjected to copious amounts of saturating rain. Living igh in the treetops, Miltoniopsis receive continuous gentle breezes, providing excellent air circulation which quickly evaporates any excessive moisture on the plants. Whether they are grown in the home or the greenhouse, air movement is particularly important during hot summer days in order to keep the leaf temperature from getting too warm. Air movement is especially important during damp overcast winter days and nights to prevent fungal and bacterial diseases from getting a start, due to excessive humidity or by water standing on the leaves or down in the leaf axils. Air circulation can be provided by many different types of fans, convection tubes, cooling systems, or by opening vents, windows and/or doors. A moist environment that has a relative humidity level of 70 to 80 percent is ideal. The warmer the temperature, the higher the humidity should be. The cooler the temperature, the lower the humidity should be. Humidity in greenhouses can be provided by misting systems, sprinkling systems, fan and pad systems, or by dampening down the floor under the benches. For the home grower, humidity can be added to the atmosphere surrounding the plant by placing the pot (or pots) on a shallow dish or tray containing pebbles and water. Keep the level of the water just below the top level of the pebbles. Never let the water touch the bottom of the pot because capillary action will take place and cause the water to rise into the pot. This will create a soaked condition of the medium surrounding the roots, which can then become vulnerable to root rot. With the root system gone, the plant is incapable of absorbing the water and feed it needs and could soon dehydrate and die. The second most important factor in the successful cultivation of Miltoniopsis is repotting in fresh medium annually. Usually by the twelfth month after potting, most of the potting media used start to break down and deteriorate. This causes the circulation of air to the roots to become restricted, and the more the potting medium deteriorates, the more moisture is held by the old medium. As a result, many of the fine roots which Miltoniopsis have will start to rot and turn soft and brown. Some of the symptoms that can then appear are leaves crinkling on new growth or leaves turning yellow and falling off, bulbs shrinking or bacterial and fungal disease attacking the leaves and base of the pseudobulbs. Repotting should be done in the late spring after flowering as the new growths are starting to develop and are approximately three ot four inches tall, or in the fall when the new growths are about half mature, and the new root growth is starting. Remove your plants carefully from their pots and remove all the old medium from the roots. At this time determine if you want to divide your plants. If you decide to divide them, it is advantageous to divide them into good-sized clumps of four to five bulbs, because the larger the clumps, the more flowers of finer wuality will be produced. Smaller two- to three-bulb divisions are all right, but the vigor in growth and flower production will not equal that of the larger clumps. One-bulb divisions are particularly difficult to propagate. After dividing, cut off all dead and damaged roots, old flower spikes and bad leaves. Depending on the size division, and, if large enough, old leafless back bulbs can also be cut off at this time. It is recommended that all cuts, breaks and other damage be dusted with sulfur, which helps to dry up these wounds, lessening the chance of fungal or bacterial infection from starting. Miltoniopsis have compact growth and do much better if not over-potted. Select a pot with good side and bottom drainage that is large enough for two new growths but too small for three. In other words, Miltoniopsis should not be potted into any container that would accommodate them for more than a year. There should be no more than one inch to one and a half inches between the plant and edge of the pot. The type selected, whether plastic or clay is, of course, up to the grower. The most popular pots however, are plastic ones which I use. They are more attractive, less expensive, hold moisture longer and salts do not build up in them as with clay pots. Neverthe less, many people prefer clay pots and do an admirable job growing Miltoniopsis in them. The type of growing medium the grower chooses is also something he or she will have to decide on. There are many factors that can determines shich type of growing medium should be used. Some of the factors to consider are local environmental conditions, type of pot (plastic or clay), and and whether grown in the home or greenhouse. The potting medium selected should be one that has good water retention yet drains well. The preferred potting medium used by most growers at present is fine fir bark. Most growers, commercial and hobbyist, usually add additional ingredients to the bark, such as perlite, coarse peatmoss, rockwool, red lava rock, shredded sphagnum, tree fern fiber, charcoal, etc. The various combinations used by growers depend on locality and environmental conditions, whether the plants are grown in the home or greenhouse and the grower’s watering, feeding and light conditions. Some growers use straight sphagnum moss or rockwool and have good results, but because of its great water retention capability, I would tend to recommend these media for the warmer and drier parts of the country, such as the southern and southwestern states, and inland valley areas. After the plant has been divided and trimmed and the pot and potting medium selected, place the plant in the pot and fill around its roots to the base of the pseudobulbs with the potting medium. Making sure that pseudobulbs are not buried in the medium, compress the medium gently down around the plant. After repotting, many growers water right away, and some, like myself, prefer to wait until the following day before watering so that any cuts and damaged areas on the pseudobulbs and roots will have a chance to heal, lessening the chances of fungal or bacterial infection getting a start. Until new root activity starts, it is best to defer feeding for one or two weeks before resuming the regular feeding schedule. 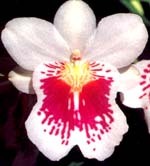 Miltoniopsis are susceptible to the pests that afflict most other orchids, although to a much lesser extent. These include spider mites, scale, slugs and snails, caterpillars, mealybugs, thrips and grasshoppers to name a few. Chewed leaves or flowers can indicate damage done by slugs, snails, grasshoppers or caterpillars. Disfigured or cholorotic leaves or flowers that are browning on the edge or wilting can indicate damage done by sucking or rasping pests such as thrips, scale, spider mites and mealybugs. There are many fine insecticides on the market nowadays that are available to eradicate these nasty little intruders. A few of the products that I use are Know-Out Aerosol insect spray, (this is Micro-encapsulated Diazinon), Schultz-instant insect spray, (made with botanical Pyrethrins), and Metaldehyde granules 3.5 for slugs and snails. It is especially important before applying any insecticide to read the label carefully. After doing so, handle and apply the insecticide in strict accordance with the directions on the label. Check with your local supplier or agriculture department for further information. Always maintain a consistent spray program. By doing so you can prevent disease caused by insect damage from getting a start and being a source of infection to your entire collection. Fungal and bacterial diseases that infect your plants usually do so because of poor cultural practices such as over-watering, low temperatures, excessively high humidity, insect damage and unsanitary conditions. These diseases can be recognized by symptoms such as purplish brown or black areas of rot on the leaves and/or pseudobulbs that can spread throughout the entire plant. Root rot can also spread upward and attack pseudobulbs and rhizomes. Other symptoms of disease are water-soaked lesions on the leaves, usually on the leaf tips or by small slightly sunken brown, yellow or black spots on the underside and/or top side of the leaves and on the pseudobulbs. The flowers can also be attacked by Botrytis, also known as petal blight. This fungal disease is caused by either low temperatures, poor air circulation or high humidity, and causes tiny black spots to develop over the entire surface of the flowers. What fungicide or bactericide should be used will depend on the type of disease your plant has. If you are unsure as to what the problem is, check with your local commercial orchid growers or orchid society for help in identifying your plant’s particular disease. The American Orchid Society, Inc., has published and excellent handbook on pests and disease, called “Orchid Pests and Diseases” which contains priceless information on these subjects. Some of the products on the market for the specific control of fungal and bacterial diseases are RD-20, Phyton 27, Aliette, Physan 20, and Subdue. The important thing to do when your plant or plants are affected by disease is to isolate them immediately from your healthy plants. If possible, cut out all diseased plant tissue, making sure that the cutting tool has been sterilized so the virus, if present, is not passed on to your healthy plants. Cut areas can be dusted with garden sulfur. Decreasing the amount of water regularly given your plant while it recuperates is essential in order to prevent the disease from spreading. By maintaining good cultural practices such as watering early in the day so that the plants are dry by evening, keeping debris, weeds and pests under control, and periodically treating your plats with good fungicide/bactericide as a preventative measure will pay dividends in the long run. When it comes to virus, Miltoniopsis are just as prone to this infectious microscopic disease as any other orchid genera. Virus can be transmitted to the plants by mechanical means such as unsterilized cutting tools, contaminated pots, stakes, or by hands that previously handled a virused plant. Virus can also be spread by aphids and by pollen transmission when hybridizing. There are a number of different viruses that can infect the plants. Plants can be tested for virus in a lab by electro-microscopy or by serological testing. Indicator plants are another method used for virus testing. This type of test for virus is called bioassay. Because no special skill is required to perform this type of testing, it can be done in your home. The seeds for growing these indicator plants are inexpensive and the plants are easy to grow. Other material needed for this type of testing is also very reasonable. The names of some of the indicator plants are Cassia occidentalis, Chenopodium amaranticolor, or Datura stramonium, which is commonly called Jimson Weed. Symptoms that appear on Miltoniopsis plants are spots, rings, and streaks that can be chlorotic in appearance or necrotic in later stages. Be aware that viral symptoms are not always visible; therefore, it is important to work with sterilized tools, pots, stakes and washed and cleaned hands. There are several ways cutting tools can be sterilized. The most effective are flaming by propane torch, alcohol lamp, kitchen stove burner or by baking in the oven for thirty minutes at 350ºF. Knives blades, and metal stakes can also be dipped into alcohol and then flamed. Some strains of virus can also be inactivated by using a 10 percent solution of liquid bleach or by using a three to four percent solution of sodium hydroxide. It is strongly recommended that any plant found to have a virus be destroyed as it is a source of infection to the entire collection and also to the collection of anyone else to whom you may give a division. Making your own Miltoniopsis cross and seeing the seed pod develop to maturity are an exciting experience; then having the seed pod flasked and having it germinate is equally exciting. When eventually the flasks are returned from the lab, the challenge of growing them to maturity and seeing the first flower open is an exhilarating and rewarding experience that you will always remember. The first step in making a cross is to select two plants for hybridizing, one for the pod parent and one for the pollen parent. After you have selected the parent plants, remove the anther cap from the plant you wish to carry the pod. The anther cap, located on the tip of the column, conatains two bright yellowish orange pollen sacks. Carefully tip up the capfrom underneath and flip out the pollinia, which in most cases will join together by a stem-like appendage which has a viscid disk at the end that adheres to anything it touches such as a pencil, toothpick, insect, etc. Unless you plan to use this pollen on something else, discard it. Next, carefully remove the anther cap and pollinia from the pollen parent. Place this pollinia on the sticky stigma of the pod parent which is located directly under where the anther cap was. After you have done this, the tip of the column will close over the stigma within twenty-four hours. The pollinia, stimulated by the stigmatic fluid, will then send out long pollen tubes which carry the sperm cells. These tubes slowly grow down through the column channel along the ovary walls. Eventually each of these tubes finds and penetrates a ovule and unites with the nucleus. Each ovule penetrated forms a seed; the ovary filled with seed is known as the seed pod. If all goes well and the cross is compatible, the ovary will steadily grow and enlarge until it reaches its maximum size and will start to ripen. It is best to allow nine months for a good viable seed pod on Miltoniopsis. The seed pod could be removed earlier, like seven months, but usually there would not be as much viable seed as there would be if you had waited nine months or longer. When your seed pod is ready, there are many fine labs that will flask your seed pod for you at a nominal price. If you are one of those brave, do-it-yourself types, there are some fine books and articles that have been written on how to do your own flasking. After your pod has been sent to the lab and the seed sown or has been sown by yourself, it will take fifteen to eighteen months (or longer) before the seedlings are large enough to come out of the flask. During this time the seeds will have germinated in a mother flask and then they will have been replated (spread) at least once, most likely twice, before growing to sufficient size to come out. When your seedlings are large enough to come out of the flask, remove the flask’s rubber stopper or lid, and fill the flask with tepid water and shake gently to loosen up the agar. Most of the time this loosens the plant’s roots enough and they can be easily pulled or flushed out. Wash off all the agar that may be sticking to the roots. Next, depending on how many seedlings you have and how much room you have, decide if you want t opu the seedlings in community pots or flats. Your seedlings can be potted in media such as fine bark, fine bark and perlite, bark and sphagnum moss or straight sphagnum moss. Water well after potting with a good fungicide such as Physan 20, Phyton 27, or RD 20. Water lightly again the second day to ensure that the medium is moist all the way through. Then go to a regular watering schedule. How often to water will depend on environmental conditions, the potting medium used and whether potted in community pots or flats. The most critical factor in getting Miltoniopsis seedlings started is not to over-water. They should not be allowed to dry out either. Wait about one week before feeding for the first time. Young Miltoniopsis seedlings respond best to half-strength feeding every other watering. A fertilizer formulation of 20-20-20 each time they are fed is desirable. The young Miltoniopsis seedlings like warmer night temperatures than mature plants do. A temperature range of 68º to 70ºF at night is optimal. Daytime temperatures of 75º to 80ºF are preferable. Light in the 800 to 1,000 foot candles range is ideal. Humidity should be in the 60 to 70 percent range and air movement should be gentle and continuous. If any of these conditions are not adhered to, the stress of these small seedlings can cause leaf tip die back. In about six to eight months after potting the seedlings in community pots or flats, they should be ready for their first pots. The type of pot and potting medium used is the individual’s choice. The pot size will depend on the size of the seedling. Normally a 2-inch pot is more than ample. From this stage, care for the seedlings is the same as for the mature plants. Miltoniopsis plants flower quite small compared to most other orchids, and a fair number of them will flower on the second bulb they develop. My wish is that these guidelines on the culture of Miltoniopsis will be of benefit to all that grow or would like to grow these beautiful orchids. This brief summary will enable you to recognize the difference between the genus Miltonia and the genus Miltoniopsis. Also, the cultural requirements for Miltonias will be briefly discussed. The genus Miltonia was described in 1837 by John Lindley, a distinguished botanist and orchidologist. He established the genus Miltonia based on the Brazilian species Miltonia spectabilis (Lindl). Miltonia, principally found in Brazil, is dedignated as the “Brazilian type” whereas Miltoniopsis is referred to as the “Columbian type”. 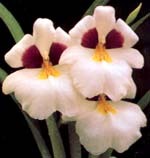 As mentioned earlier, species belonging to other genera were incorrectly placed into the genus Miltonia over the years. This was the case with the species of the genus Miltoniopsis that was established in 1889 by Godefroy-Lebeuf, who recognized it as morphologically different from the genus Miltonia. The Brazilian type of Miltonia plants can be easily distinguished from Miltoniopsis by their two-leafed pseudobulbs which, like the leaves, are yellowish green and have a climbing-type rhizome. When in flower, the petals and sepals of Miltonia plants are quite starry compared to Miltoniopsis flowers; also the color patterns of the flowers can be quite bizarre. With the exception of Miltonia spectabilis, most species of the genus Miltonia have very small lips compared to the large magnificent lips that the genus Miltoniopsis have. The culture of Miltonia is a little easier than the culture of Miltoniopsis. They can tolerate more light and heat, less water, and can be grown in pots or on slabs of tree fern or bark. Light, the main difference in the culture of Miltoniopsis and Miltonia, should be around 2,400 to 2,800 foot candles. Daytime temperatures of 75º to 85ºF and night temperatures of 60º to 64ºF are ideal. Watering intervals will depend on whether the plants are grown in pots or on slabs. Miltonia plants can be grown successfully in any of the media discussed in the Miltoniopsis section of this article. Fertilizer formulations also are the same as for Miltoniopsis as are humidity and good air circulation. The treatment for fungal and bacterial and viral diseases, and for control of insects should be the same as discussed in the Miltoniopsis section. The main flowering season for Miltonia is usually midsummer of to early fall.